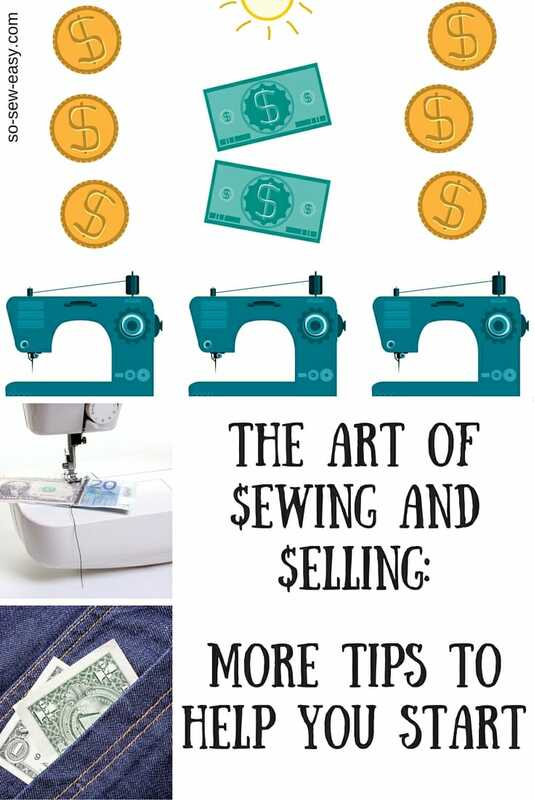 Selling is as much an art as sewing is –and if you are willing to be creative and serious in both, then it may be time to showcase your work and earn some money too by practicing the art of sewing and selling. The first thing to do is to have the mindset of a professional. Turning a hobby into business could take the fun out of it, so it is best to be aware of this before you start. Remember that you cannot please everyone so get ready for both good feedback and some potentially bad. “You can’t please all the people all the time” as they say. Having family and friends who always believe in you is a definite plus during this time. And if you can find or create a need in the market then go ahead, fill it and sell it. Strauss and Davis found a unique need and they filled it. True, this is definitely easier said than done –but it can be done! There are many good ideas on how to make money out there in the field of sewing, and they not limited simply to sewing your items and selling them –so be creative. For example, you don’t really need a fancy degree to teach sewing to beginners. What is important is that you know more about the art of sewing than your students and that you have a desire to communicate and teach that knowledge. You could say, offer a sewing class for kids or beginners and teach them how to make a pillow cover or an apron. You could pitch your idea for a sewing class to your local school or even as part of an adult education program in your town. You can also simply offer demonstration classes at home. This is a great way of advertising your skills and potentially your products. There are many other ideas like this. Just think outside the box! You also don’t need to know everything about sewing before you offer your products or services to others. Simply specialize on a few sewing items and distribute business cards emphasizing your skills. Advertising at the local dry cleaners, textile stores and online is always a good start. 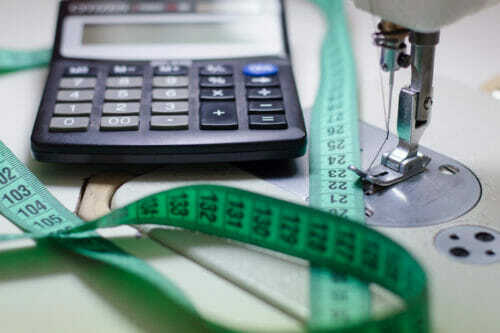 For instance, your sewing skills can be the answer to anyone who wants well-fitting jeans or a tailored jacket. Find out what the competition is doing and learn all that you can from them about what seems to work –and equally as important, what doesn’t work. Research what is selling well online and produce them yourself to sell in your neighborhood or community. Recycling antique fabrics into nursery bedding or christening dresses can be a good idea because they can be sold at a high price. These exquisite items can also be sold in online selling platforms like eBay, CraigsList or Etsy, so you are not limited to your locality. If you'd like some ideas about what an Etsy store looks like, please have a look at the So Sew Easy store on Etsy called "Print or Plain". In this store we've focused on our niche of easy-to-sew projects and patterns. We also offer some niche products like knit stay tape that are hard to find and helpful for our readers. Lastly, don’t forget to take care of your tax matters as well. Make it a practice to keep records so that at the end of the day, you will know if you make a profit or not and which products or services are the most profitable. This should also help motivate and keep you on track as you see the numbers progress. At the same time, you will realize that you will not make megabucks overnight. Perseverance is one of the most important business skills and you will need loads of it. To keep good financial records, you can use a simple piece of paper, a computer spreadsheet or even a sophisticated online accounting package like Xero. It really doesn't matter how you do it, but just that you do it! In these days when information goes around at lightning speed, there are a lot of advantages like immediate access to almost anyone in the world. So be creative with your sewing and selling and find your niche in the global market. Tell us about your plans in the comments. We'd love to hear from you! Start now with some of these sewing ideas to get your creative juice running: Sewing for profit. Projects that are great to make to sell. If you've already started a successful sewing enterprise or even started one that didn't work out, we'd really appreciated it if you could share your experiences in the comments below. I know everyone always finds the comments extremely useful and interesting. I started making items for our sailboat. Word spread like lightning. I had to create a price sheet, and basically charge 50.00 (us) per hour plus materials. That way if the person wants to spend that amount, it is worth my time. I’m a full time nurse, so my free time is very precious! I made an enclosure that was unique, and told my husband we should patent the pattern. He’s familiar with the process, and said it would involve to much time, money, and effort. Plus you have to try to defend your design. I decided it wasn’t worth it. Two weeks later, a man came up to our boat (while we were on it) and started talking pictures! Live and learn! Stick with your gut feeling, and charge enough for your services. I always have work! Well I’ve read your article and came away wanting to do something again. I’ve actually sewn for years now starting in high school making clothes so I could look like all the other girls. That was in the 50’s so it wasn’t hard and I had a lot of guts then. I went to all the school dances so I could make gowns and I made a bunch of them. Now I’ve lost my guts but still want to do something. I love bags. Purses, suitcases, briefcases, little bags anything and everything if it’s a bag. I’m just crazy about them. I’ve tried making some and they turn out ok but I’m very critical of myself. Also I find that my color coordinations are not that good. At least I’m critical of that too. Like you said in the article, there are so many making bags and some bags are very involved and time consuming. That spells cost. As a hobby, I’ve made christening gowns for friends for years and I love to do that also. Lots of lace, pintucks, long gowns and real fun to watch them come together. About 8 years ago, a friend of mine had triplets and I offered to make christening outfits for the babies and they turned out great. She had 2 girls and 1 boy so I made gowns for the girls and a boy’s short pants suit for the boy. And bonnets for all. You know I think I just found out what I should do. Thank you for asking for replies. I think it’s time to get to work and make bags for my fun and christening gowns for sale. If I can find a picture of the ones I made, I’ll try and shoot it over to you for a look. Thanks again. Dear Pat, I am sending you a big e-hug, I wish you luck in your new found goals. let me know if you find that picture, as it turns out I am going to be a God Mother for the first time in my life. I will be making a christening gown for the first time in my life. I’m considering a blog and an etsy store along with craft sales/markets. I’ve signed up for my first craft sale but haven’t been accepted yet. My son is going to work with me to help me start a blog and my daughter is going to get me going on an etsy store. Your info has helped a lot. Thanks!! Hi LeAnn, good luck with your project, you are lucky you have your kids to help. I’ve not yet started anything but I’m definitely considering it. With this advice, I feel a little more confident. Thanks so much. Thank you for clearing a few things up. I have thought about starting to sell a few things maybe through Etsy but wasn’t sure about the rules so it put me right off. I wiil now look into it again. Great idea but am afraid there are minimum market potential for tailored items. pls help ! Great post, Lots of good advice.. I have so much fabric some Vintage to make and list on my kaystylejewelry shop. Thank you and Deby for doing this. I love everything that you do here because you all are so generous. I’ve been wanting to step out but have let procrastination and fear take hold. Thanks so much. How do you handle collecting tax when sellling to someone in state?